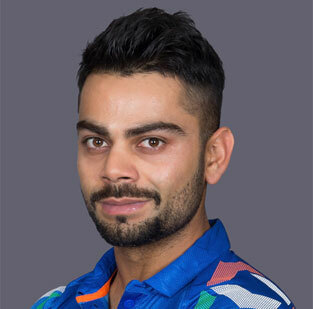 Virat Kohli (born 5 November 1988) is an Indian cricketer player who currently captains the India national team. He is a right-handed batsman, often regarded as one of the best batsmen in the world. He captained India Under-19s to victory at the 2008 Under-19 World Cup in Malaysia. He is first cricketer to score three centuries in his first three innings as Test captain. He is also the second Test captain to score centuries in his first two Test innings after Greg Chappell. He also first captain to score 11 international hundreds in a calendar year in 2017. Kohli become first captain scores more than five double hundreds in Test cricket. Earlier West Indies great Brian Lara hold the record with five double tons. Kohli also became the first to score over 500 runs in a bilateral ODI series, he scores 558 runs in 6-match series during tour of South Africa 2017-18. 27-Oct-2018: Virat Kohli become first Indians to scores three consecutive hundred in ODIs. 24-Oct-2018: Virat Kohli became the fastest-ever batsman to reach 10,000 one-day international runs, making history in his 205th innings against the West Indies in Visakhapatnam. Previous records was Sachin Tendulkar in scores 259 innings. 03-Jul-2018: Virat Kohli became the fastest batsman to complete 2000 runs in T20 international cricket, he completed this achievement in 60th match and 56th innings. 02-Dec-2017: Virat Kohli became the first captain to score Test hundreds in each Test of a three-match series. (min 3-match series). 29-Oct-2017: Virat Kohli becomes the fastest to get to 9000 ODI runs in 194 innings. Previous records was AB de Villiers in scores 205 innings. 28-Sep-2017: Virat Kohli becomes fastest ODI captain to 2000 runs as he used just 36 innings to achieve the feat. He surpassed AB de Villiers who did this in 41 innings. 15-Jun-2017: Virat Kohli breaks AB de Villiers's world record of being the fastest to score 8000 ODI runs, he took 175 innings while AB took 182 innings. 10-Feb-2017: Kohli first batsman in Test history to smash four double-hundreds in four successive series. Bradman and Dravid scores three-series. 22-July-2016: Virat Kohli becomes first Indian captain to hit double ton outside India against West Indies in Antigua. 13-Dec-2014: Virat Kohli becomes the second player to score two hundreds on their captaincy debut after Greg Chappell. 11-Dec-2014: Virat Kohli becomes the 3rd Indian to score a ton on his captaincy debut in Test. 09-Nov-2014: Virat Kohli became the fastest to reach 6000 One-day International run mark, bettering legendary West Indian Vivian Richards' record during his 53-run knock in India's third ODI against Sri Lanka in Hyderabad on Sunday. 21-Nov-2013: Virat Kohli became the fastest batsman to score 5000 runs in one-day internationals when he scored 86 against West Indies in the first ODI in Kochi. 14-Oct-2013: During the second ODI against Australia in Jaipur, Virat Kohli scored the fastest century by an Indian in one-day internationals in 52 balls and broke Virender Sehwag's 60-ball record. 18-Mar-2012: Virat Kohli's 183 in the Asia Cup match in Mirpur is the highest score by a batsman against Pakistan, obliterating the 138-ball 156 by Brian Lara at Adelaide on January 28, 2005. 13-Mar-2012: With his century against Sri Lanka in the second match of the Asia Cup on Tuesday, rising Indian star Virat Kohli became the fastest batsman to score 10 one-day international hundreds in fewest number of innings (80 innings, 83 ODIs). Virat Kohli has become the first Indian batsman to register two hundreds followed by two fifties in consecutive innings - 118 against Australia followed by 105, 64 and 63 not out against New Zealand.